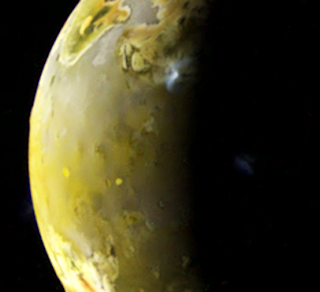 The last major paper on Io out of the Galileo mission was published in the October 2008 issue of the journal Icarus. 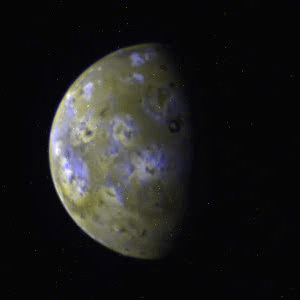 "Galileo observations of volcanic plumes on Io," by USGS researcher Paul Geissler and NAU grad student Melissa McMillan, describes the observations acquired of Io's plumes during the entire Galileo mission. The abstract can be found at the link above, but the article itself is available to subscribers (individual or institution) only. In this paper, the authors searched the Galileo SSI data set for volcanic plumes on Io, then used those images to determine particle sizes, column densities, and plume masses. 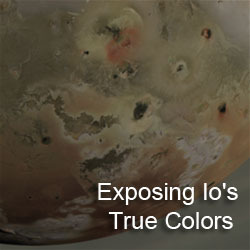 In all, the authors found plumes at 13 sites spread out across Io. 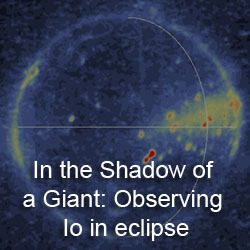 These include optically bright dust plumes (like the one shown at left), faint dust plumes, and gas plumes, with the latter seen in eclipse observations by Galileo. In some cases, the authors found several of these types at a single volcanic center. For example, on I31 in August 2001, a Prometheus-type dust plume was observed at Thor, which was vigorously erupting at the time. A faint outer halo was also observed in the high phase angle images from that orbit. Pele-type plumes, large, faint plumes generated from gas emitted from lava fountains, went largely unseen by Galileo as SSI had poor sensitivity in the ultraviolet where these types of plumes are best seen. Pele's plume was observed on two occasions, during E4 and G29. Another Pele-type plume was also observed at Grian, resulting in a transient large plume deposit. 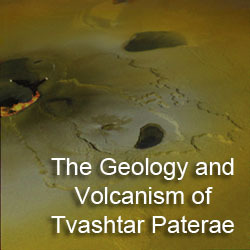 Several Pele-type deposits were also observed, at Dazhbog and Tvashtar, while additional changes at Pele suggest that additional large plumes existed during the Galileo mission. The authors then examined the visible-light spectrum of various dust plumes to determine the mean particle size and total plume mass. The authors determined that the small, optically-dense plumes seen at such volcanoes as Zamama, Pillan, and Prometheus consist of course-grained "ash" particles. Combined with the presence of a central dense column in these plumes, and the authors suggest that these particles erupt with the gas in the plume. Typical mass for these plumes was found to be around 106 to 107 kg. The authors also examined the faint outer halo at Thor. They found that the faintness of the plume is not because there is very little dust, but because they are made of much finer particles, 10 nm versus the 80-120 nm found in the brighter core of the plume. With particles that small, the plume would be more easily visible at ultraviolet wavelengths. Strangely enough, the faint outer halo has 10-100 times more mass than the inner, "dense" core. Keep in mind, as well, that even accounting for that inner core, the dust makes up only 10% of mass of these plumes, with the gas making up for the rest of it. The particles in the faint outer halo at Thor (and seen at Loki during the Voyager 1 flyby) are thought to condense directly from the gas in the plume, forming small, sulfur "snowflakes." The authors also compared the observed plumes to the surface changes found by Galileo. They determined that the surfaces changes were caused by the dense, dust plumes, and not by the fainter gas/snowflake plumes, except in the case of the Pele-type plumes, which produce large, red rings. The deposits made by the gas plumes likely take the form of SO2 frost that is transparent at visible wavelengths. The mass of the plumes suggests that dust fallout makes up only a small fraction of the overall resurfacing on Io.